Can I Play Pambazuka 6/49 Online? Read Reviews! Days of Draw: Wed., Sun. Have you tried all lotteries out there? Already feeling bored and looking for something new? Look no further than Pambazuka National Lottery. With a name like that, the game should probably offer some explosive prizes. We’re about to find out together if this is the case. Pambazuka 6/49 is a brand new lottery in Kenya. It is a game in the portfolio of Pambazuka National Lottery, an entity that was set up for the purpose of organizing lotteries in 2016. The game has been available since 2017, which makes it a pretty new lottery. Pambazuka 6/49 has a somewhat different format from other 6/49 lotteries. This fact, combined with the rater inexpensive ticket prices has quickly increased the popularity of the lottery in Kenya. Drawings occur two times per week and there are two drawings per day. The purchase of a ticket worth 80 Kenyan shilling entitles the player to participate in both of the daily lotteries. Is Pambazuka 6/49 a Scam? 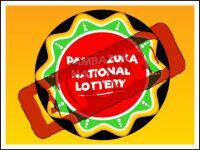 Due to the fact that so many scams originate in African countries, there could be many people hesitant about giving Pambazuka National Lottery a try. This shouldn’t be the case. Pambazuka 6/49 is carried out by a national entity that follows Kenyan laws and regulations. The Pambazuka National Lottery was set up in 2016. It is a licensed organization that has its activities regulated by the Betting Control and Licensing Board. On top of giving people an affordable opportunity to win some cash, the Pambazuka National Lottery is also committed to supporting local projects and helping the Kenyan economy develop. Thus, if you’re in Kenya and you’d like to try a fun lottery, you should definitely give Pambazuka 6/49 a try. The lottery is completely legitimate and regulated on a national level. You don’t risk anything, whether you decide to buy a ticket the old-school way or through the Pambazuka National Lottery website. Playing Pambazuka 6/49 is far from complicated. In order to test your luck and have a chance of winning the big jackpot that exceeds 100 million Kenyan shilling, you have to choose six main numbers in the range from 1 to 49 and a Mzooka number in the range from 1 to 10. If you don’t have specific numbers that you want to play every single time, you can also opt for a quick pick ticket. In that instance, the numbers will be assigned randomly by a machine and printed on your ticket. Combo tickets are also available. These cost more but they enable you to enter more than 6 numbers at once. A combo ticket can feature anywhere between 7 and 10 numbers (a system in its essence) and such a ticket will potentially enable you to win multiple prizes. Since Pambazuka 6/49 is a relatively new game, the biggest jackpot hasn’t been won yet. The biggest jackpot in the game is handed to players who get the 6 main numbers and the Mzooka number correct. Currently, the Mzooka Jackpot is set at over 108 million Kenyan shilling (approximately 1.04 million US dollars). On top of the massive jackpot, there are also two mini-jackpots per drawing. The amount of the mini jackpots will come in the range from 10 to 18 million Kenyan shilling. Sums vary depending on the number of individuals who have bought tickets for the respective drawing and the number of winners. To win a mini-jackpot, a player will have to get all 6 of the main numbers correct. So far, there haven’t been players who have matched the 6 main numbers or the main numbers and the Mzooka Powerball for a chance to win the massive lottery jackpot. The closest that people have come to winning the big prize is matching 5 numbers. The prize for matching 5 Pambazuka 6/49 numbers is in the range from 80,000 to 150,000 Kenyan shillings. Since its inception, Pambazuka 6/49 has handed out more than 40,000 prizes. While it’s still too early, we have no doubt that someone will soon be capable of snatching the grand prize and proving that winning the big jackpot in the game is far from impossible. People in Kenya have three opportunities as far as playing Pambazuka 6/49 goes. The first option is buying a ticket from an authorized vendor, the second one involves the acquisition of a ticket online and the third possibility is a ticket buying via SMS. In order to claim a prize, a player will have to present the ticket and a valid national form of identification. Amounts under 50,000 Kenyan shillings can be claimed at any authorized retail venue. For a larger sum, the player will have to visit the Pambazuka National Lottery headquarters in Nairobi. Whenever a larger sum is involved, it will be paid either via check or a wire transfer to a Kenyan bank account. Players have 90 days from the date of the drawing in order to make a prize claim. Can You Buy Pambazuka 6/49 Tickets Online? If you are currently in Kenya, you can get a ticket from the Pambazuka 6/49 official website. Currently, however, you cannot acquire a ticket for the Kenyan lottery if you are residing in another country. Would you mind rating Pambazuka 6/49? Only time will show whether Pambazuka 6/49 is going to be a serious success. So far, the game has generated some buzz and it’s already acquired loyal fans in Kenya. If you are in the country, you can definitely give it a try. The rather affordable ticket price justifies the effort. Kenyan here, it has become a tradition for me and my friends to get Pambazuka 6/49 tickets every Wednesday and Sunday. We pool our funds together and buy a bunch of tickets with the hope of winning the big jackpot soon, good luck to us!